Hi lovelies, I have been seeing so many pumpkin recipes floating around the web over the past few weeks that I became obsessed with the idea of baking some kind of pumpkin thing. Preferably paleo approved. I got my hands on a large can of pumpkin and pretty much baked for 4 days. Talk about pumpkin overload. Anyway these little muffins were my best work. I had followed a bunch of recipes to make the other pumpkin things but these were sort of my little experiment. I quite enjoyed them and my friend Jen said they were delish. Figured it would be nice to share with you guys. Directions: In a food processor, combine eggs, melted butter,pumpkin, vanilla, dates (microwaved for 1 minute in 1 tbsp water then mashed),honey, bananas and blend until combined. Mix all dry ingredients i.e flours, cocoa powder and spices together. Add them to the wet ingredients and blend. The batter will be a little thick but it's ok. Scoop into muffin tin (I use muffin liners cause it's so much easier), bake for 40 minutes. Allow these babies to cool and enjoy. Try not to eat them all at once. 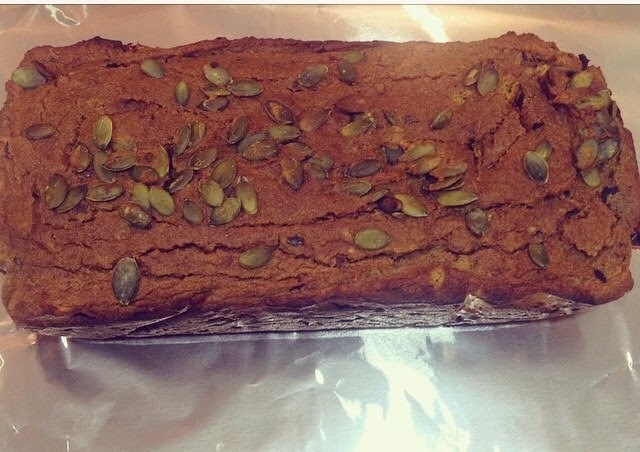 Also made this pumpkin loaf which was really good. Get the recipe here.